Unleaded fuels are undeniably safer for your health, but the same might not be said for your engine. Engines built during the time of leaded fuels are often not prepared to cope with the unleaded gasolines available today. In the past, Tetraethyl Lead (TEL) was added to fuel as an antiknock additive. 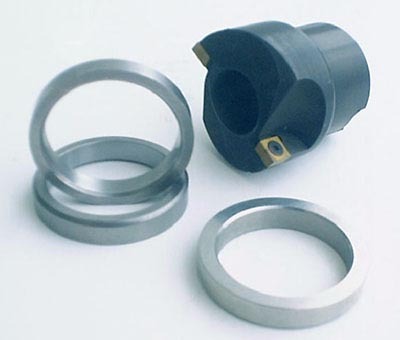 This compound not only excelled at increasing the detonation resistance of the fuel, it also served as a high temperature lubricant to valve stems, seats and guides. 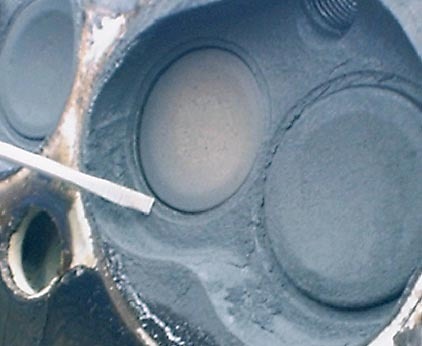 With the elimination of lead from available gasoline, this vital lubricating quality was lost. Measures must be taken to protect components against extensive wear over short periods when used without TEL enriched gasoline. 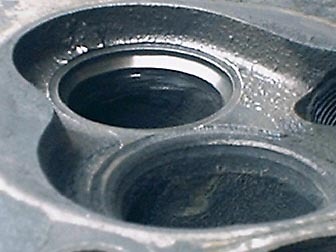 "Seat recession" is the most common ailment encountered when unleaded fuel is used with heads designed for leaded fuel. 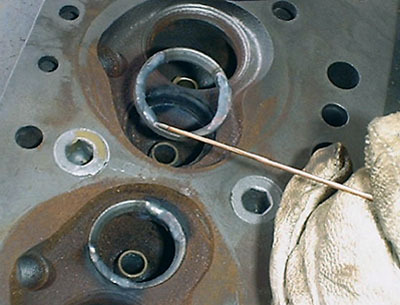 In this case the valve seat is worn away continually, allowing the valve to sink lower and lower into the head. 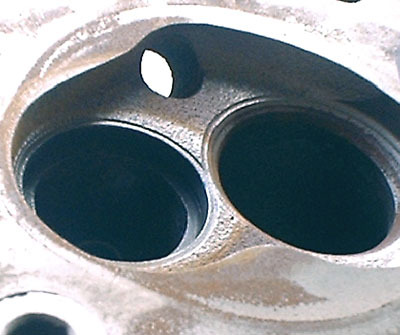 This problem is most severe on the exhaust side where excessive temperatures are encountered (as seen in the above photograph). Because the exhaust valve is actually sitting down in a pocket, the flow capabilities of the valve/seat interface are very poor. After removing the valve and quickly cleaning the combustion chamber with a wire brush, the worn out "pocket" is readily apparent. In this case the pocket was over .060" deep, which is substantial. An engine which needs constant loosening of the exhaust valve lash at service intervals is likely suffering from this malady. If valve lash is ignored for extended periods while seat recession progresses, the valve lash will eventually become 0. 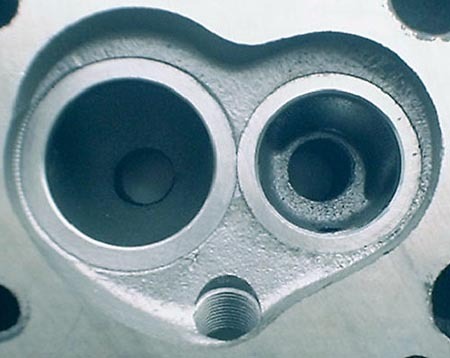 When this happens, the valve is no longer held firmly against the seat when closed and the heat transfer from the valve head to the seat during that time is diminished. Overheated valves tend to "burn" and will quickly degrade until they no longer resemble a valve at all. With the head disassembled, the seat area shows the tale. There is an obvious recession all around the periphery of the seat, however the angled line and right side of the seat show where the eroded valve kept working against it even after having burned out to a crescent shape. The answer to keeping seat recession at bay, is to replace the original softer seat and valve materials with harder, more heat resistant ones. 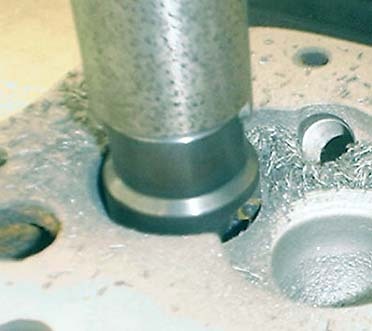 Shown above is a selection of hard-alloy valve seats and the type of cutter used to machine the pockets necessary to install them. With the head fixtured into a machine, the pockets are cut to depth in accordance with the seat insert dimensions. After the inserts are pressed in place, the result is a hard wearing and heat resistant material for the valve to mate against. 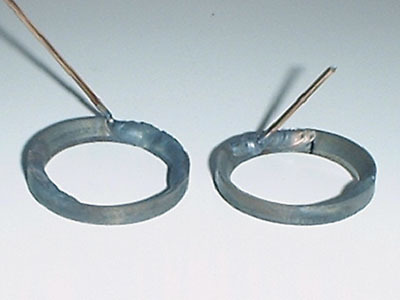 These hardened inserts not only possess higher strength and wear resistance at elevated temperature levels, they also transfer heat better as well, helping to cool the valve itself. We use hardened exhaust seat inserts in all our heads and often inlets as well. Another consideration when using unleaded fuel, is exhaust valve and guide materials. 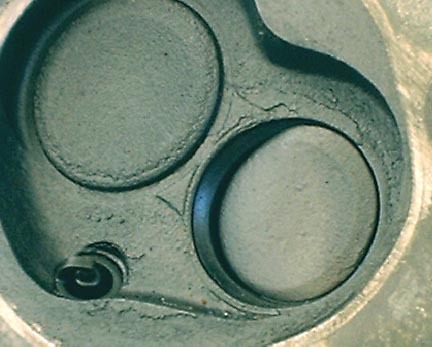 Because the exhaust valves experience so much heat as opposed to inlets, a more heat resistant material should be chosen. 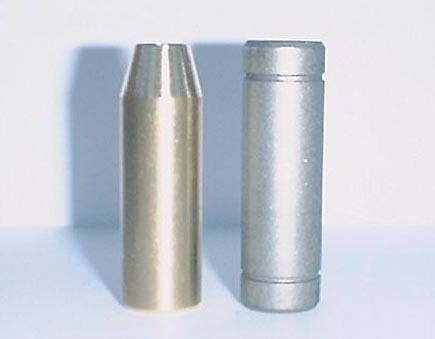 While there are various grades of stainless steels capable of maintaining their strength at elevated temperature, Stellite composition has long been known as the best. We choose Stellite faced exhaust valves whenever possible to allow for the greatest durability in demanding situations. Guide material also plays a roll in unleaded fuel compatibility. Manganese bronze not only possesses better lubricating qualities than cast iron does, it also offers better thermal conductivity. This increased ability to transfer heat away from the valve stem helps to cool the valve, offering an unparalleled advantage over the contemporary cast iron counterpart. Again, our choice is to use manganese bronze guides whenever possible for these reasons. Sometimes heads have already been modified for seat inserts which might need to be replaced. 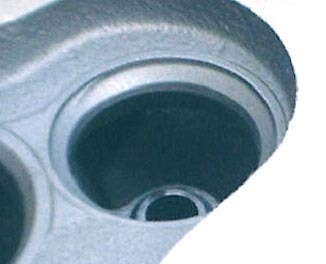 Because seat inserts are a press-fit into the cylinder head itself, removal can only be done by eliminating the interference between the two. To eliminate the press fit, we TIG weld a bead of metal around the inside face of the insert. 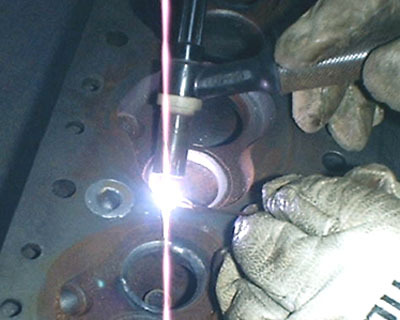 We often leave a short piece of filler rod welded to the insert material in order to ease removal of the insert. This can easily be done once the inserts cool after welding. The process of welding on the seat with it confined to the diameter of the cylinder head pocket causes it to shrink upon cooling. It is not uncommon for seats to literally fall out when the head is turned upside-down after this process. The original undamaged pocket can now be cleaned and checked for proper interference with a new hardened insert.